Parks and arboretums virtually come alive when they are depicted in a perspective view as opposed to a standard flat map design. Forests, wetlands and flower beds can be finely illustrated, along with park buildings, athletic fields and many other highlights. Click on the sample links at the right to see the full versions of these beautiful and informative maps. This map features each building, athletic facility, museum, zoo and golf course, along with wooded nature areas, in this popular metropolitan recreation area. Commissioned and funded as part of a major restoration of the park it was produced as a wall-sized mural, and serves as the central feature in the park’s Orientation Center. This map serves as the visitor guide for St. Louis’ beloved arboretum, showing all of the grounds in detail with every trail and path and each specific garden area accurately plotted. Of special interest to visitors is the architectural detail shown for the world-famous Climatron greenhouse facility. This is one of a series of Massachusetts Audubon Society wildlife sanctuary visitor maps. 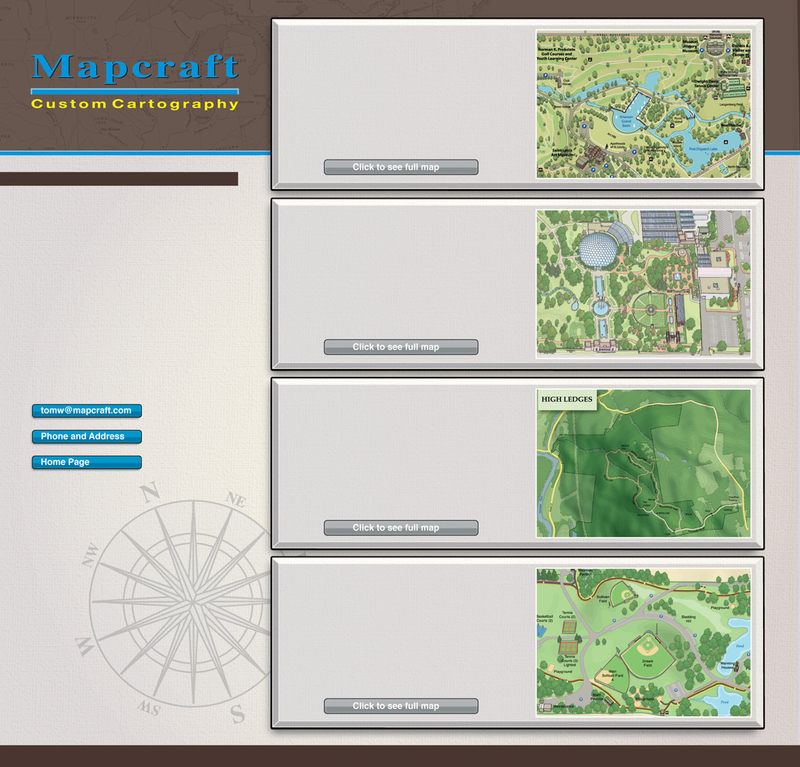 Each map portrays fields, wooded areas, trails and wetlands along with topographic shadowing and contours. The maps in this series are designed for nature enthusiasts including hikers and birdwatchers. This map is posted at a small town park in Woodstock, Illinois and frequently reprinted in community publications. It highlights facilities for public use including baseball and soccer fields, aquatic center, playgrounds, trails and jogging paths. It is also a helpful guide when the park hosts regional athletic events.